The Evster: For me the conversation starts and ends with Bake McBride. He was an immensely popular Philadelphia athlete, as proven by the countless number of Bakes who I grew up with in the Bala Cynwyd area. In my 3rd grade class alone, we had a Bake Rosenberg, a Bake Eisenstadt, a Bake Cohen, no wait, two Bake Cohens, and a black kid named Bake McBake. McBride was just a phenomenal outfielder, and he was also named Bake. ZWR: I believe you just made that up. The Evster: Yeah, I did. I was just trying to make a point. ZWR: What could that point have possibly been? The Evster: That Bake McBride was a nice guy? ZWR: No, that he was popular. You said it in the second sentence. The Evster: So you got the point? ZWR: Yes, but you could have acquitted yourself much better there. Like Bake McBride, when he was gliding around the astroturfs and sliding into the bases with his glorious ‘fro. The Evster: But Zoo, what about Garry Maddox? Fantastic centerfielder, good speed in the leadoff hole, and a stalwart on those great Phillies teams of the late 70s and early 80s. ZWR: Yeah, but his name was Garry. The Evster: Good point. That’s a really good point. ZWR: Did anyone ever try to team up with McBride and give the two of them the nickname “Shake n' Bake?” I can see a doofy white guy like Jay Loviglio trying that. The Evster: I’d try that. The Evster: So what’d we decide here? 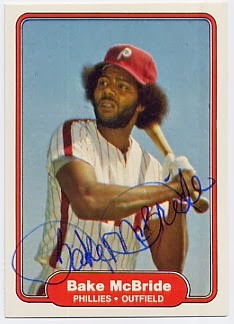 Best Philadelphia athlete named Bake ever: Bake McBride? Or Garry Maddox?